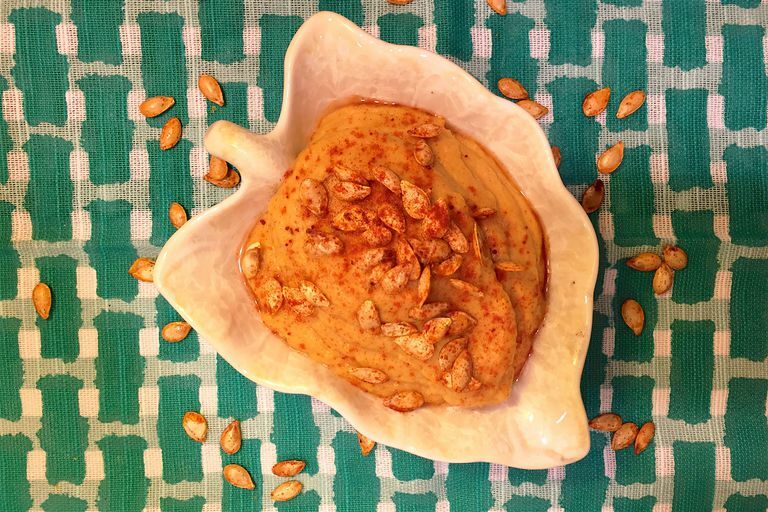 This recipe for butternut squash tahini dip is a great way to incorporate a seasonal vegetable into a low-carb snack everyone can enjoy. Similar to hummus, this dip uses tahini but is made primarily with butternut squash instead of chickpeas. Dates add a little natural sweetness to complement the squash, while coriander, ginger, and cinnamon add layers of fall spice and smoked paprika adds a sweet-smoky flavor. Preheat oven to 325F to roast squash seeds. Combine diced squash, 1 tablespoon olive oil, and water in a medium pot and turn heat to medium-low. Cover and cook, stirring every 5 minutes to prevent from sticking, for about 20 to 30 minutes until squash is completely soft and liquid has evaporated. If the liquid is still remaining in the pot after 20 minutes, uncover for the remainder of cooking time. Meanwhile, separate the seeds from any stringy flesh and toss with a drizzle of olive oil (about ¼ teaspoon) and a dash of smoked paprika. Spread in an even layer on aluminum foil and bake in preheated oven for 25 minutes. Set aside and use as garnish. When squash is cooked, transfer to food processor and add remaining olive oil, tahini, lemon juice, garlic clove, salt, coriander, ginger, cinnamon, smoked paprika, and dates. Blend until smooth. Serve at room temperature or chilled, garnished with toasted squash seeds. This recipe was made with Kosher salt; if using fine sea salt or table salt reduce the amount by half. Medjool dates are a great alternative to refined or concentrated sweeteners. In this case, dates were used instead of maple syrup, which is a go-to sweetener for winter squash. Dates add potassium, magnesium, and fiber and help thicken the dip. This recipe is vegan as is but if you are looking for something extra creamy, try incorporating 1 cup non-fat plain Greek yogurt into it once chilled. Adjust consistency with water or a little additional lemon juice as needed. For a recipe that is more similar to hummus and for extra protein and fiber, add 1 1/2 cups cooked unsalted chickpeas to the blender ​along with the cooked squash and remaining ingredients. This dip is great with whole wheat pita or whole grain crackers, but for a low-carb option, serve with raw or blanched vegetables such as celery, cucumber, sweet bell peppers, or carrots. This dip can also be served warm as a vegetable puree to accompany an entrée such as roasted chicken or folded into a vegetarian dish such as rice and beans to add more layers of flavor and create a creamy consistency along with the bonus of getting more vegetables into your meal.